Every machine created by man has tolerance for error including the Bryan Intoxilyzer 5000. For the Intoxilyzer this error tolerance is reported in grams of alcohol/210 liters of breath. It’s just another source of erroneous breath test results for persons accused of DWI in Bryan, Texas. During a subject test the Intoxilyzer will first analyze the vapor from the reference sample. The result of this analysis must be within +/- 0.010 g/210 liters of the predicted value which is entered by the technical supervisor. If the reference sample result is not within the machine’s tolerance for error the Intoxilyzer will invalidate the test. The Intoxilyzer then purges the sample chamber with room, or ambient, air. The machine analyzes this air blank for alcohol and other interfering chemicals. If the air blank contains anywhere from 0.00 g/210 to 0.019 g/210 liters of alcohol, the intoxilyzer will report the blank as 0.00 g/210 liters. The Bryan criminal defense lawyers defending DWIs should use this to their client’s advantage when cross-examining the technical supervisor. The accused should be given the benefit of this error tolerance and 0.019 should be subtracted from the Intoxilyzer 5000 test result. Finally, the Intoxilyzer must verify the results of the suspect’s breath samples, agreeing within +/- 0.020 g/210 liters. If breath samples agree within this tolerance the machine will validate the test. If the results do not agree it will invalidate the test. 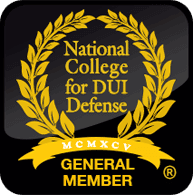 Why is this tolerance important to those accused of DWI? The machine always measures two samples of a person’s breath about two minutes apart from each other. These samples must agree within machine tolerances to be valid. For instance, if the first sample of breath was measured at 0.10 g/210 liters, the second sample could be anywhere from 0.08 to 0.12 g/210 liters to satisfy the error tolerances. The accused should be given the benefit of this error, as well. The Bryan defense lawyer should be locking the technical supervisor in at the lowest possible valid result, not forgetting to also subtract the 0.019 for the air blank. Copyright © 2016 Stephen Gustitis. Attorney at Law. All Rights Reserved.